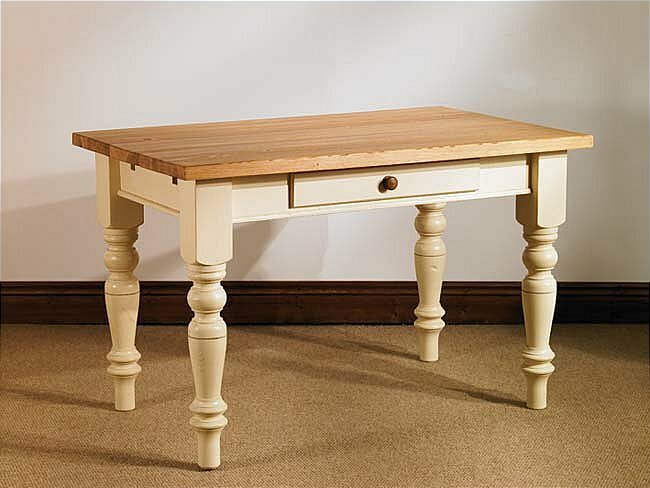 Painted Pine 6' x 3' Turned Leg Table - Mottisfont MFHT03 This Made to Order painted Pine table is available in 4', 5' and 6' sizes with Tapered or Farmhouse style legs which are detachable. Each table has a drawer in the side as standard. Available in white, cream, blue or green with a choice of wooden knobs or metal handles. 2 extension leaves are available as an optional extra, which slide into each end, adding an additional 305mm on either side. Please phone or contact us for this option and prices. You may also choose to have an Oak top instead of Pine if you prefer. Please state your preference of finish and handle style at time of ordering.